Welcome to Holtzhausen Clocks & Music Boxes! Please feel free to contact us for clock service, repairs and restorations in Johannesburg, Pretoria, Centurion, Tswane and the greater Gauteng on 0832525239 or 011 6787722. We have been taking in clocks for service, restorations and repairs since 1974, adhering to the Code of Practice of our registering Institute . Holtzhausen serves as the representative of the British Horological Institute in South Africa. The Institute's magazine, 'The Horological Journal (HJ) is the oldest continuously published technical journal in the world. First published in September 1858 it has appeared monthly ever since – without fail.' BHI Website. A clock requires a service once every 5 -7 years. Compare this to an automobile that runs only a few hours a day and requires a service every year the marvel of clockmaking starts unfolding. Over a 10-year period a clock's maintenance will cost you 5% of an average vehicle's cost. Add to this that a good clock increases in value once it has reached 40 years of age, the little invest in time and money to maintain it becomes negligible. After having discussed your clock's condition, ailments and approximate cost of service, Herman will book an appointment to collect it from your home. You are welcome to bring it to us too. Many customers have had bad experiences with fly by night operations where clocks went missing or parts were replaced with older parts from other salvaged movements. This leads to clock owners wanting their clocks serviced on their properties. It is possible to trouble shoot at your premises and make minor adjustments to the clock movement. We can even lubricate it in your lounge. Servicing requires that we take your movement with us though. The reason for this is that we have to dismantle a clock movement to a level where each part is spread out on the bench. We then clean the wheels and plates, rebush where needed, reassemble and lubricate. Running the clock through its full 8-day cycle at least once after the service is an integral part of a good service. In fact, without that, your guarantee is not worth the paper it was written on. Therefore it is of utmost importance that you select your clock service agent with great care. This entry was posted in Uncategorized, Clock Repairs on June 27, 2016 by admin. 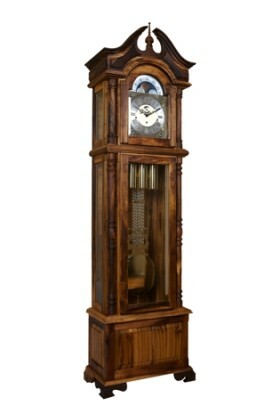 Holtzhausen Clocks offers this first in a range of modern grandfather clocks for sale. Since 1974 we have been a household name in the manufacturing and supply of traditional bespoke clocks in South Africa. In 2004 we added Antique Long case clocks to our range, refurbishing them to the standards of our discerning customers. Now in 2016 we are responding to the requests of our customers to introduce to the market a range of clocks fitted with the best mechanical movements encased in handmade structures of high end materials. These modern grandfather clocks are astounding works of art, transcending the limitations of traditional design. The handmade clock pictured below is made of brushed stainless steel and 15mm sandblasted perspex. The Stainless steel is well known for its strength and beauty. The Perspex is light yet more durable than glass. This structure is maintenance free and will outlast most materials on the market today. The heavy base with wood spacers ensures that the clock will not fall over. The protected mechanical movement is a German Hermle playing the Westminster melody. The LED light shines up into the movement, creating a unique feature at night. Please contact us to make an appointment to view. This entry was posted in Modern Grandfather clocks and tagged modern grandfather clock on January 24, 2016 by admin. Buy pre-owned Rolex watch - what to look out for. You have decided to buy a pre-owned Rolex watch; we think it is a good idea. The search and discovery is a true adventure that comes with a sense of excitement and accomplishment. I prefer it to walking into a jeweller and pointing at what I want. Finding the Rolex that feels like yours from the moment you hold it is as exhilarating as meeting an interesting person who will change your life! Fakes. Holtzhausen doesn't buy a pre-owned Rolex watch unless we have had it certified as authentic. Unauthorised replacement parts. Holtzhausen's certification of authenticity entails opening the Rolex watch to see what is inside. Unserviced watches. We have a Rolex serviced when we buy it, unless it was serviced in the past 3 years. Any wind-up watch requires servicing every 5 years. Unrealistic expectations. Remember that a Chronometer has a margin of -.4 and +.6 seconds per day - even a Rolex. Incorrect terms. Ask, ask ,ask is what my mother taught me. If we say the pre-owned Rolex is mint, ask us what we mean by that. This entry was posted in Rolex and tagged Rolex Watches on June 27, 2014 by admin. Luxury Wall clocks come in varying styles. This Kieninger 2591-56-01 wall clock is a Regulator with full Westminster melody. The dial is genuine enamel and the hands are milled and in Breguet style. The 8-day movement also features second indication. This Wall clock case is Rosewood veneer. A small drawer houses the winding key. The pediment is finely decorated, have a look. In true Regulator style this wall clock has a compensation pendulum in bi-color. This luxury wall clock comes in a triplet with a mantel clock and grandfather clock made in the same style. Any one of the three clocks can be bought seperately. Please contact Holtzhausen at admin@holtzhausen.com to order. Holtzhausen has been in the clock industry since 1974. We only deal in top end luxury clocks and music boxes. Kieninger is the world's oldest existing clock brand. The factory in Aldingen Germany has gone through many transformations. Nowadays Kieninger is known for exquisite luxury clocks as well as mould breaking avante garde styles in wall clocks and grandfather clocks to accentuate the style of the most discerning modern dwelling. This entry was posted in Wall clocks and tagged luxury wall clocks on April 24, 2014 by admin. The Kieninger 2547-22-01 wall clock, fully imported from Germany, pictured in dark Walnut is an exceptional example of today's high end wall clocks or Regulators for sale by Holtzhausen as sole agents of Kieninger Wall clocks in South Africa. The Kieninger mechanical movement is the PS060 which strikes on a spiral gong on the half hour and a passing strike on the hour. This wall clock has an easy to operate night shut off lever. The pendulum is a high precision compensation grid pendulum. The silver plated multifunctional dial comes with etched rhombic decorations, applied diamond turned chapter rings, second indication, day, date, month and a moon phase. The hands are blue steel. All visible accessories in these Wall clocks are chrome plated and all glass are beveled crystal glass. See the fine polished stainless steel accent in the base. This wall clock Kieninger 2547-22-01 is a member of a group of meticulously crafted, elegant time pieces. There are two other products to this group, a mantel and a long case clock, all in dark walnut with fine polished stainless steel accents in pediment and base. These wall clocks are also available in black satin piano finish. Please contact Holtzhausen for more info. This entry was posted in Wall clocks on April 16, 2014 by admin. Many families associate the Rand Easter Show with, amongst other things, a forest of grandfather clocks. If the Music and the announcements paused for a second, anyone walking through Hall 5 would hear the chiming of not one, but many Rand Easter Show Grandfather Clocks at the Tick Tock Time stand. To see that forest of clocks online now please visit www.holtzhausen.com where you will also find a selection of wall and mantelpiece clocks, as well as fully mechanical Swiss imported music boxes and German cuckoo clocks. We are advising the public early, that we will not be at the Rand Easter show this year, but we invite you to come and visit us and our clocks in our showroom in Johannesburg. Rand Easter Show Grandfather Clocks was a stand run by the Holtzhausen Family. The business was started in 1974 by Nic Holtzhausen, and many years later in 1998 his son, Herman took over the family concern and continued exhibiting not only at the Rand Easter Show, but all over the country. Herman established a national footprint for the clocks. There is hardly a city he can drive through, without pointing out to his children just how many houses in that area there are to which he has personally delivered grandfather clocks. And many of these clocks were Rand Easter Show Grandfather Clocks. This year, as a pre-Rand Show Grandfather Clock special, we are offering our customers the chance to visit our showroom in Auckland Park where they will be able to view a top of the range Tubular Bell Grandfather clock on special at the amazing price of R95,000. It's a clock that previously would have been seen amongst Rand Easter Show Grandfather Clocks. While this clock normally sells at R120,000, this year, because we will not be exhibiting at the Rand Show, we will be holding a flagship sale of our showroom stock. To visit us there, phone Herman on 083 2525239 and make an appointment to come and view our Tubular Bell grandfather clocks, amongst others. If you have an interest in smaller clocks, then contact us to view our cuckoo clocks and music boxes. While the grandfather clocks are made from a crossover of world treasures – the combination of a fully mechanical German mechanism with a cabinet crafted from rare African hardwoods, our cuckoo clocks and music boxes are full imports coming from Germany and Switzerland respectively. The Cuckoo Clocks are a new addition to the family business, made popular when we exhibited Rand Show Grandfather clocks. The occasionally cuckoo clock on the wall always drew the attention of families who would chat to us in the stand while waiting for the cuckoo to pop out from behind the doors and call. The interest shown by the public lead us to import more cuckoo clocks which you can also come and see in the quietness and privacy of our showroom. Phone Herman on 011-678 7722 to make an appointment – we look forward to receiving you! This entry was posted in Grandfatherclocks on March 13, 2014 by admin. Available online at the best price in the UK, visit www.grandfatherclocks.co.uk or contact us for an up to date price on the Howard Miller Urban Floor 660-125 Clock. Imported from the biggest clock manufacturer in the USA, the clock will be delivered to your door and into the room of your choice. Set up is easy, just follow the instructions and it will soon be chiming in your home. Buying a clock is a once in a lifetime purchase, and this Howard Miller Urban Floor 660-125 is a choice for the modern home. Freed from the traditional curved solid wood designs of a traditional clock, this one escape into simplicity, and finds its home there. As perhaps, you have found your home away from the interior decor history that can sometimes be heavy, of the previous generation. This clock will seal your deal as a free flying unencumbered lover of Zen and modernity. Simple, contemporary and elegant in design. Nickel finished molding. Crisp, white dial. Nickel finished bezel and simply-styled hour markers and hands. Cable-driven, Westminster chime Kieninger movement with automatic nighttime chime shut-off option. Finished in Black Satin on select materials, hardwoods and veneers. What more could you want in clock for your simple unencumbered home, where you are free to breath, away from the world? If you like minimalism, are considered by your friends to be fussy about neatness and cleanliness, and are in the market for a classy clock, then the Howard Miller Urban Floor 660-125 is the clock for you. For an up to date price, and the cheapest in the UK, see www.grandfatherclocks.co.uk or contact us, for details. And in the meantime, dream on. It could be yours. This entry was posted in Grandfatherclocks on March 12, 2014 by admin. I don’t know about you, but whenever Christmas comes around the one person I struggle to buy a present for is my father. This is partly because my father is a very easy-going person, with very few unmet wants and needs. The one thing I always find worked was biltong. And as a result, he got a lot of that over the years. But after a while, and particularly as my earning power has improved over the decades, it feels rather paltry to only be buying my one and only father a packet of biltong for every single Christmas. Something I didn’t think of until this year, was the idea of something mechanical. My father has already made his own grandfather clock, from wood that he chose himself and encased around a top quality German mechanism, so I knew not to look in that direction. But looking around on websites, I realised that the idea of mechanical music goes much further than that of clocks. Once you start thinking “mechanical music” a whole world of automaton opens up, and brings with it a sense of timelessness, perfection and precision. Mechanical music gifts and boxes are ideal for men who have everything they need, and who make everything they possibly can. And maybe that is the joy of a mechanical music box, or any size or sort. The fact that the average South African man who comes from an era where he made everything, knows that a music box outwits him. He cannot make this. It’s handcrafted, but unlike a golf cart, he cannot make it himself. And because he cannot make it himself, he will never cease to wonder at it. Every time he winds it up and listens to that amazing mechanical melody, he will think about all the gears and cogs and cylinders inside that inlayed box, and he will marvel at the technology that made that happen. Because, the lathe down in the garage does give him an inkling of what it is about. He knows how he would start making such an item, but he knows that he couldn’t finish it. And because it is greater than him and his needs and abilities, it will charm him for the rest of his life. It's a Men's gift ideas he hasn't thought of! And if this man is anything like my father, he will also enjoy every opportunity at every dinner party or family occasion, to charm all his guests with this mechanical wonder. So whether it is a small incense holder with a music box in it, or a stand alone music box valued at half a million rand, he will love nothing more than winding it up and lifting the lid, allowing it to play its melody to all his friends and family. It's great for Men's gift ideas. This entry was posted in Grandfatherclocks on March 11, 2014 by admin. What’s happening at Holtzhausen in March 2014? For our full range of grandfather clocks see our website www.holtzhausen.com but if you want to know what’s happening in terms of top Grandfather Clock sale March 2014, then stay with me on this blog. Regarding the woodtype, the Grandfather Clocks Sale March 2014 is offering this clock made in Tambotie wood – Tambotie wood is one of Africa’s hardest and most rare wood types. Because it is such a hard wood, it is harvested naturally and not grown in plantations. It is considered one of the most treasured woods to start a fire with, as it will keep burning for many hours longer than any other type of wood. The crown of the clock is shaped in the traditional swan neck that will blend in with most classic furniture. The mechanism plays the traditional three melodies: The Westminster, The Whittington and The St.Michaels. It also sports a night shut-off for people who will be disturbed at night by a chiming clock. If you are interested in our clocks, but not ready to commit to a purchase of this size, then please visit our websites to have a look at the other clocks in our range. Grandfather clocks start at R34,000 and go right up to the Tubular Bell Flagship clock at R120,000. We also stock a range of cuckoo clocks as well as a selection of the best Swiss music boxes. In our showroom in Auckland park we have a selection of complete clocks, but if none of those suit you requirements then you are welcome to have your clock made to order. This entry was posted in Grandfatherclocks on March 10, 2014 by admin. In my last post I discussed the idea of considering purchasing clocks as retirement gifts men. I also discussed setting the balance – a skill that any clock owner will have to master if he is going to fully enjoy their new acquisition which was given to them as retirement gift for men. If these purchases were made in South Africa, they were no doubt found at www.holtzhausen.com . In this post I am going to discuss another aspect of owning a fully mechanical clock, that of how to set the time. It sounds easy! Surely you just wind the hands on? If you were considering a quartz clock as Retirement gifts men, then yes, it is as simple as moving the hands on until they reflect the correct time. If you are the proud recipient of a fully mechanical clock however, that was bought for you as a Retirement gifts men, you will need to know a couple more things than that. Firstly, it is important that you always move the minute hand on in a clock-wise direction only. The hour hand you can move backwards, but if you moved the minute hand backwards you can damaging the gears of the clock. Secondly, when you do move the minute hand on, it is important that you silence the chimes of the clock first. If you don’t do this, the mechanism cannot keep up with the speed with which you move the clock on, and you will scramble the chimes. You can silence the chimes by activating the “silent” lever, which is normally on the right hand side of the clock, either on the clock face itself, or on a lever on the right hand side just under the mechanism. If you cannot find the silence lever, then still move the minute hand on, but this time make sure that you stop every 15 minutes to allow the clock to chime, before you move it clock wise again. This obviously is a time consuming process, and only worth doing if you only need to move the time on an hour or so. If you need to move the time on 2-12 hours, then it is obviously worthwhile finding the silence lever first. The other thing you need to know about setting the time, is that sometimes you find your clock in a strange situation where the clock may chime 3 o’clock, but the hands show 4 o’clock. This can freak out any clock owner who believes in the supernatural, but I need to reassure you it is the easiest problem to solve. All that you need to do is to move the hour hand back to the time that the clock chimed (so in this case 3 o’clock) and then silence the clock and move the time forwards to the actual time (in this case 4 o’clock). Remember, that if you don’t want to silence the clock, and if it is just an hour you have to move it, you must simply stop at each quarter and allow the clock to chime. In my next blog, I will look at how to slow the time down, or speed it up, if you are the proud recipient of a fully mechanical clock given to you as a retirement gift for men. This entry was posted in Grandfatherclocks on March 4, 2014 by admin. Holtzhausen established in Johannesburg in 1974 is a leading Clock and Music Box specialist finding its clients amongst Africa and the world's most discerning collectors..
© 1974 - 2018 Holtzhausen Clocks. All Rights Reserved.